PRO UMANITAS wishes happy holidays and a successful and blessed New Year 2012 to all its partners and friends. The "Association for the support of the hospital Criuleni" from Switzerland holds with Dr. Beat Wicky, Dr. Karlheinz Leemann, Dr. Beat Reber, Margit Moser und Father Erwin Benz the inauguration of the surgical wing of the hospital Criuleni. Vladimir Nadkrenicinii and Cristina Burucenco from PRO UMANITAS, who provided assistance to the project, take part in this event. They rejoice at this project together with the ophthalmologist Dr. Tatiana Ghidirmschi. Father Erwin Benz uses this short visit to contact with the projects of PRO UMANITAS. Christmas is the most beloved feast of children. It is a family feast, when a Christmas tree is decorated, Christmas songs are sung. The little ones wait impatient for Santa Claus, who will bring them gifts, because they were obedient during the whole year. In order to bring happiness to children, who have no possibility to celebrate a real Christmas, "Südzucker AG" supported the Christmas action. About 1400 children from our projects and those who belong to the catholic parishes of Moldova (including Transnistria), will receive Christmas gifts. Advent - a time for expectation and hope. Many attend the morning divine service (Rorate) in the Roman Catholic Church from Chisinau. The German organization "PRO MOLDAVIA e.V." offers a breakfast to the parishioners. The gathering in the church and the joint meals are very appreciated; cohesion and unity can be experienced; this is very valuable, especially in this pre-Christmas time. Everyone is so grateful for this opportunity. Hilfswerk Liechtenstein shows its commitment to the deprived children of Moldova, by sending regular transports with humanitarian aid to Moldova. Thus, Mrs. Beatrice Amann, president of Hilfswerk Liechtenstein delivered another transport with humanitarian aid – about 18 tons of canned food and about 3 tons of clothes. 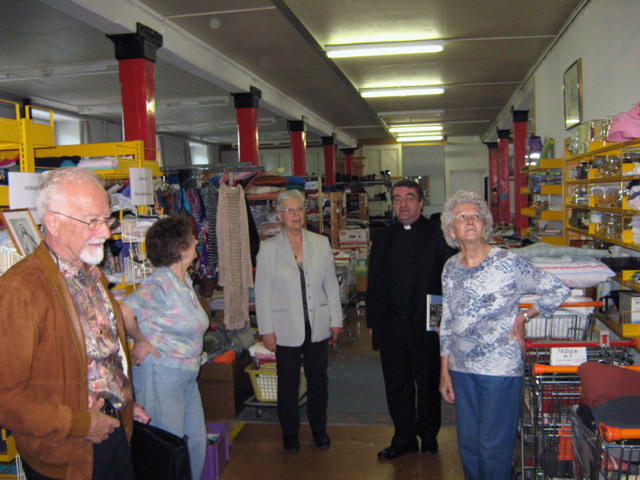 At the same time, the Swiss Rotary Club, Zug-Kolin sent clothes, shoes, bed-clothes, etc. for BUNVOLENTIA projects. The received humanitarian aid is a great support for the deprived children and their families. 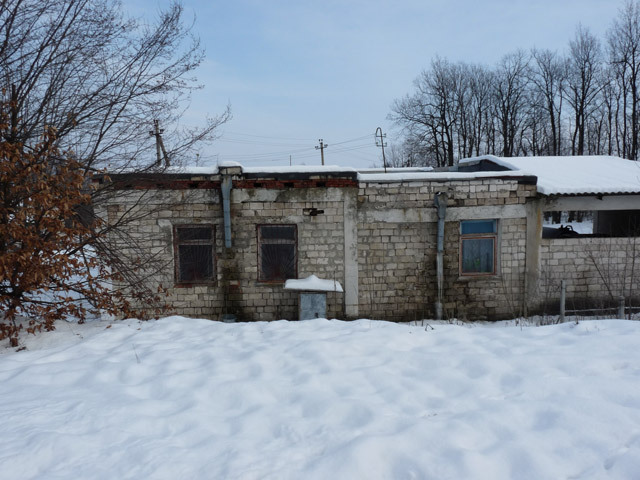 Poverty and misery are strongly imprinted in Moldova. Children, these innocent creatures, are those who suffer under these circumstances. With the arrival of winter another problem is arising now – lack of warm shoes. Children that come from poor families have no possibility to buy winter shoes. 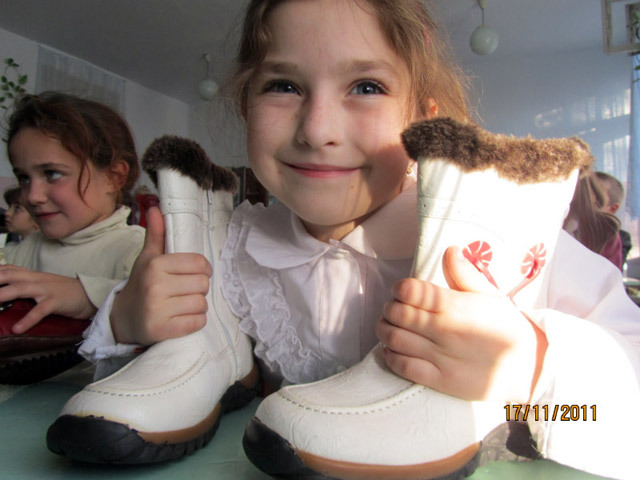 Due to the support of Krutzler family, Pinkafeld / Austria we could purchase warm winter shoes for 25 children that visit our day care center BUNVOLENTIA – Singerei. The bright eyes of children are the best testimony of gratitude. The Garst family from Switzerland comes to Moldova to the official opening and blessing of the day care center BUNVOLENTIA Singerei. 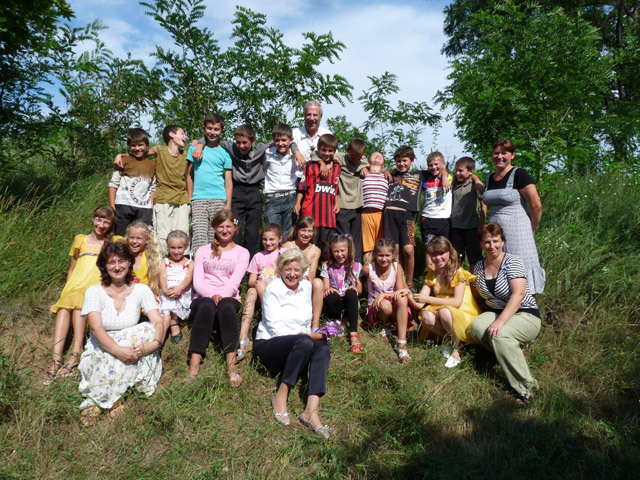 Mr. Peter and Mrs. Martha Garst are accompanied by the Zürcher family, who visits Moldova for the first time. 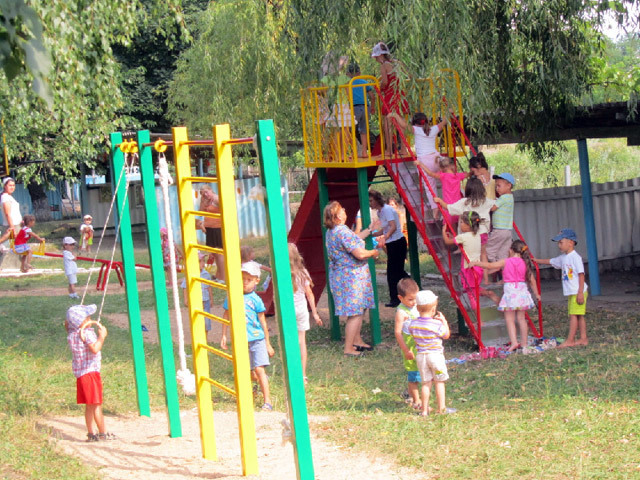 Our partners also visit their projects – day care centers for children BUNVOLENTIA – in Moldova and convince themselves of the great necessity of these projects, that offers a home and an education to hundreds of children in need. 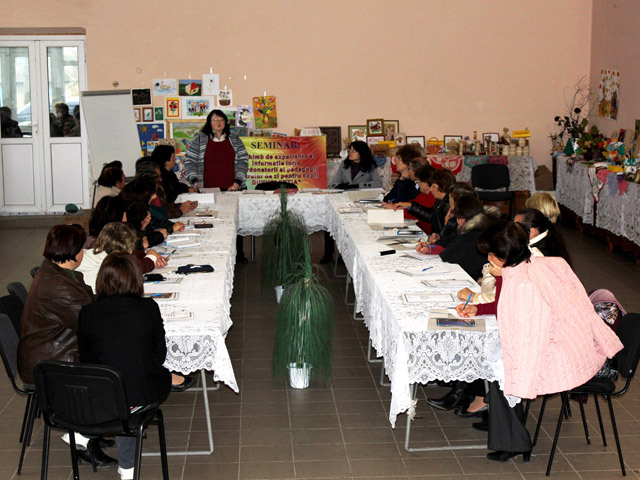 The 8th seminar for educators and teachers of the day care centers BUNVOLENTIA took place on Ovtober 22, 2011. A specialist in working with children and teenagers from socially disadvantaged families presided over the seminar. Various activities to determine the category of "socially disadvantaged" and the "risk situations" were proposed to the participants. This seminar was a new experience for our teachers and educators. In addition to this seminar, another meeting for cooks was organized. 24 educators and teachers, and 9 cooks took an active part in the seminar. 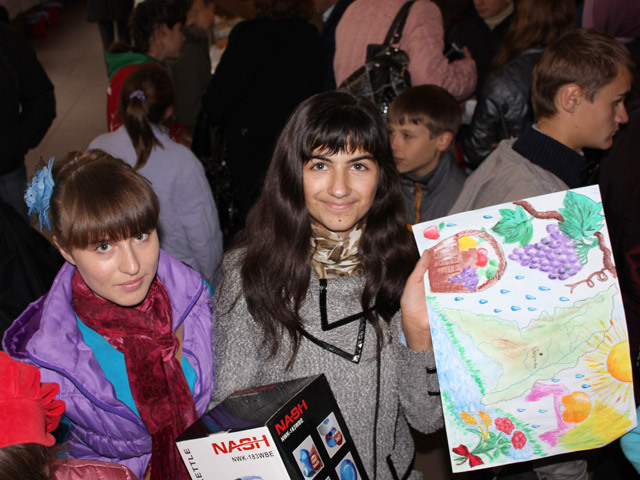 Of course, there were organized an exhibition of children's work and several competitions. Children were very happy about the beautiful results they've shown. Every young person has the right to a good education, so that he/she could be employed as qualified workforce on the labor market. Unfortunately, not all students have such a possibility. It is very expensive to study at a public or private university nowadays. The state provides annual scholarships, but not all students can benefit by a scholarship. The bursary program, which is financed by Mr. Douglas Funk from "Solon Foundation", offers to 50 students from deprived families good educational opportunity this year too. A further student meeting took place on Saturday, October 15, 2011. As always, the students were familiarized with the conditions of the program and signed contracts. Some students expressed their gratitude to Mr. Funk by letters of thanks. 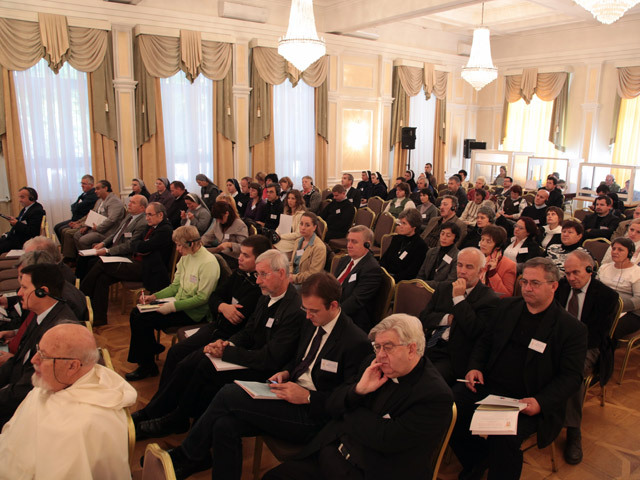 The first Catholic Week was held in Moldova in the period from October 11 till October 14, 2011. 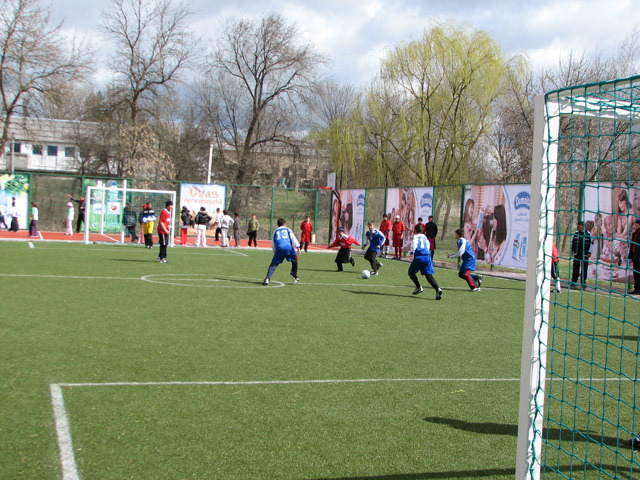 This charitable action was organized by the local Catholic Diocese and had as its theme "The social commitment of Catholics in Moldova". 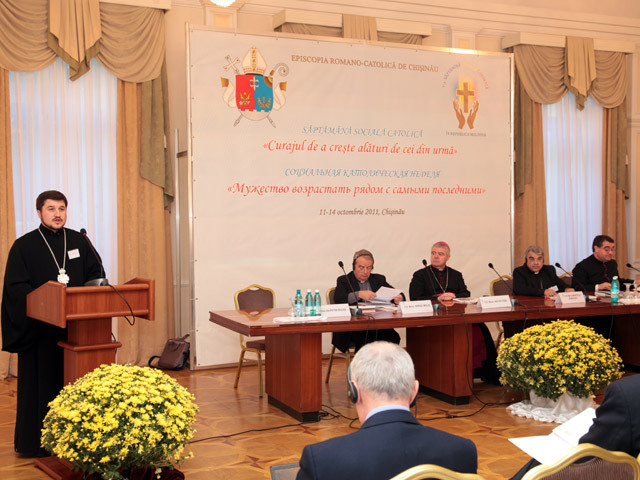 Distinguished guests, among whom Representatives of the Orthodox Church, Ambassadors of Italy and Romania in Chisinau, Member of Moldovan Parliament, Representative of the European Commission in Moldova, were part of the event. At the invitation of Bishop Anton Cosa, the President of PRO UMANITAS, Mr. Vladimir Nadkrenicinii, participated in the social week. Lectures and joint reflections on the given topic were offered to the guests. On a request of the former president of the district Singerei, and now the mayor of the town Singerei, we opened our next day care center BUNVOLENTIA in the gymnasium of Singerei. The gymnasium is located at the edge of the town and is attended by the poorest children from the neighboring villages. The opening of this day care center brought joy not only to the children and their parents, but also to the teachers and the local authorities. The day care center for children started its activity at the beginning of September 2011 and offers them healthy meals and an occupation. Children also do their homework with help of competent teachers. At the beginning of the school year the children and the staff of the boarding school for children with slight mental disabilities in Straseni could experience a great event – The repair of laundry come finally to an end. Poor condition of the rooms, that violated the hygienic and health standards, health claims from the staff, poor equipment of the laundry impelled us to make a request to KINDERMISSIONSWERK, in order to repair the building completely. 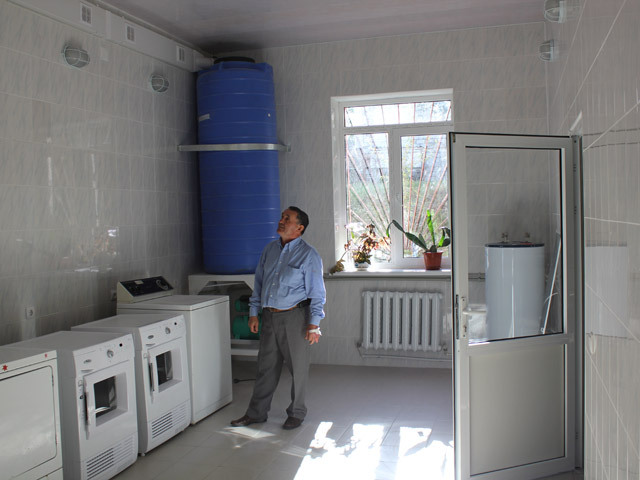 Thanks to the received funds, it was possible to carry out the necessary repair works and to purchase cloths driers. The boarding school has a great, well-equipped laundry now. 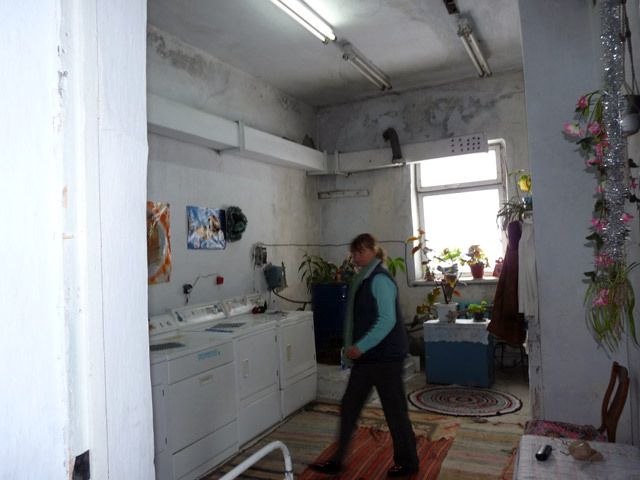 At the same time, there is the possibility to organize trainings for the older children in the laundry. Mrs. Beatrice Amann from Hilfswerk Liechtenstein and Priest Erwin Benz from Baar come to us on September 5. 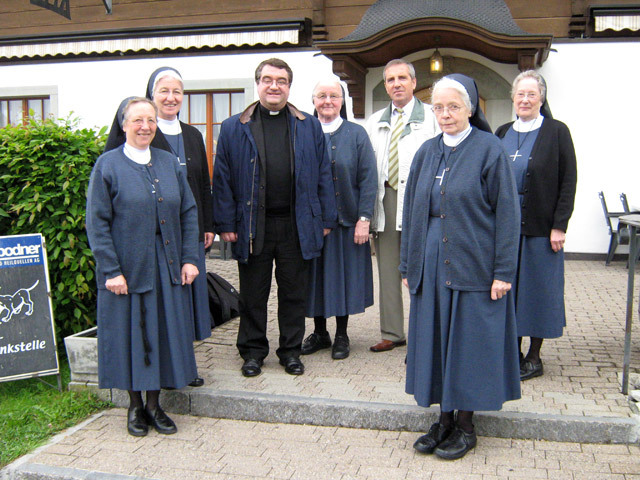 They visit the sister organization CONCORDIA, the diocesan ordinary and the PRO UMANITAS projects in Grigorauca, the children projects BUNVOLENTIA in Gangura and Cojusna, the boarding school with the mini-farm, which was financed by Hilfswerk Liechtenstein (Mrs. Beatrice Amann) in Straseni and the Low Vision Center of Dr. Tatiana Ghidirimschi. They represent different sponsors from Liechtenstein and Switzerland and are happy and grateful to report about the valuable and efficient projects implemented by PRO UMANITAS in its motherland from their personal view. 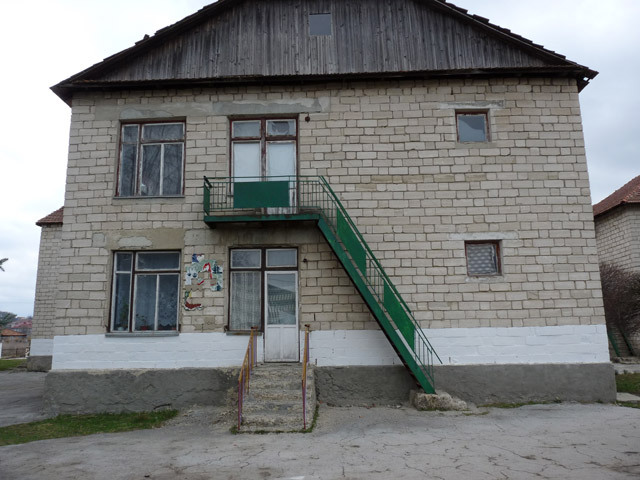 Children from the village Ochiul Alb, who go to the village school, could not take proper lessons because the flat roof leaked and let rain water and snow penetrate. As a result, the walls and ceilings were always wet and moldy. Under these circumstances, the school was in danger to close a part of the building. Thanks to the timely funding of the project, which was taken over by the German organization KINDERMISSIONSWERK, children can continue their studies in dry school rooms as from September 1st. The kindergarten Nr. 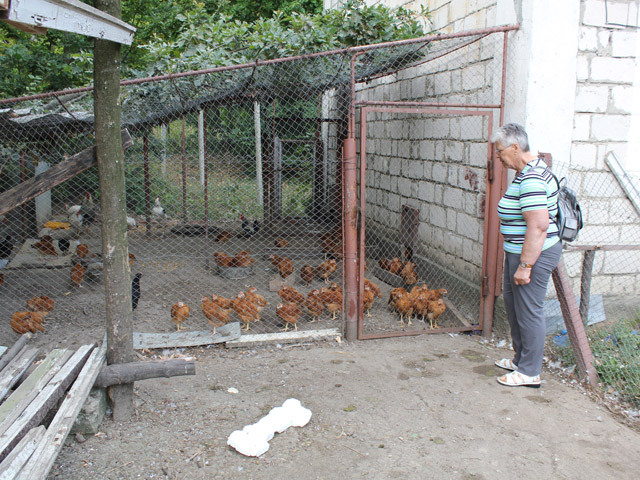 1 "Poienita" from Cojusna received 130 children at the age of 2 to 7 years. 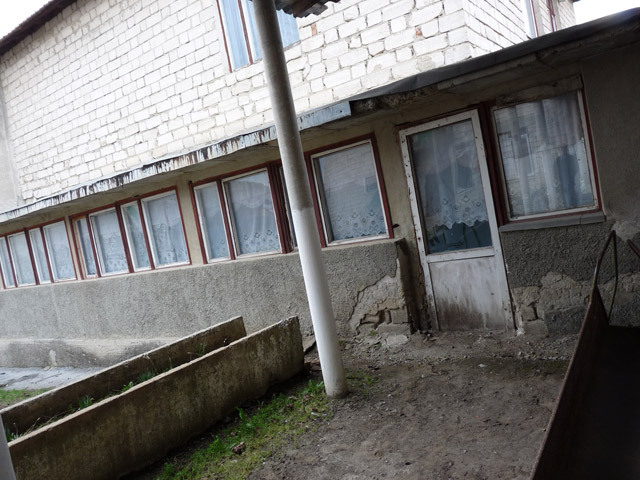 Because the budget of the local municipality is too small, only small repairs could be carried out in the kindergarten during 25 years. The poor conditions did not allow opening more children groups, in order that all children from the village could go to kindergarten. 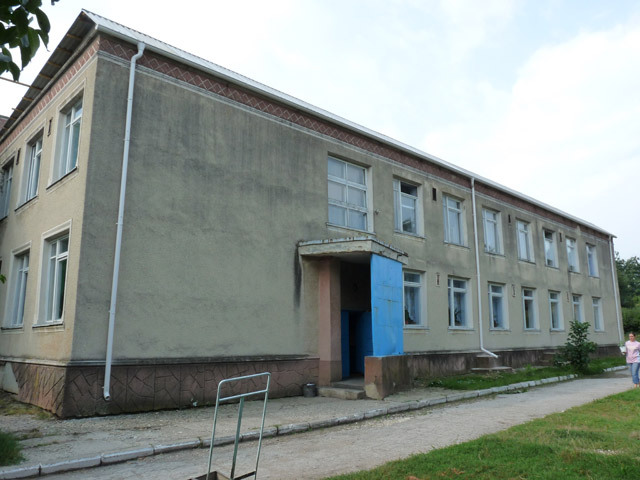 The project, financed by KINDERMISSIONSWERK, permitted to reinstall 129 windows and 7 doors in the kindergarten. Our kids are sleeping in dry rooms now. In addition, a new children group for 25 children was opened, so that 155 happy children spend their time in the kindergarten. "Children: fill your hearts with joy!" Pastor Clemens Bombeck / Pro Moldavia Gladbeck comes again to Moldova for a few days. He was immediately "taken away" to Străşeni (where the renovation works of the laundry within the boarding school are currently carried out) and Cojusna for a few hours. He could convince himself of the well done renovation works in the kindergarten. There was also a very friendly meeting with the mayor of Cojusna, Mr. Victor Căpăţînă. After a brief conversation in the mayor's office, he led Father Clemens through the rooms of the kindergarten, showed him what needs further renovation, and then led him into the rooms that were already finished. He expressed his gratitude for the help provided to children from Cojusna. These words of thanks Father Clemens will forward to the children in Gladbeck and to the KINDERMISSIONSWERK in Aachen. The "Sternsinger" are the ones who make possible helping children around the world and also the children from Moldova through their annual action at the beginning of a year. 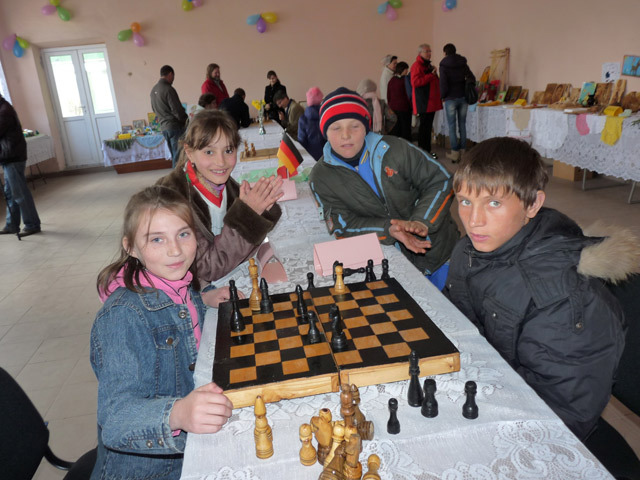 The German organization "KINDERMISSIONSWERK" continues its activity in Moldova for benefit of deprived children. 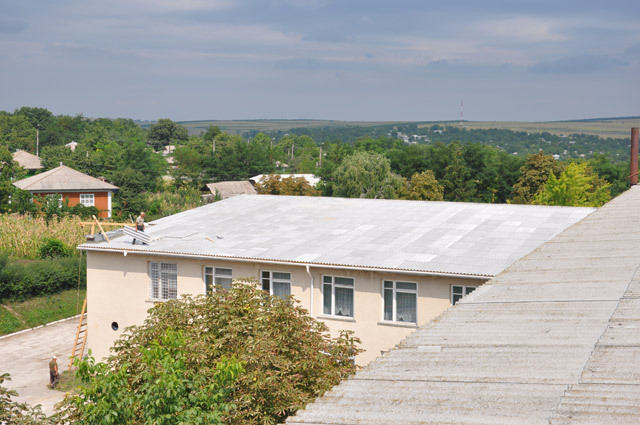 The implementation of two further projects – roof repair of the school in Ochiul Alb village and renovation of the laundry in the boarding school for children with slight mental disabilities in Straseni – is now possible. The above-mentioned projects will contribute to improvement of educational and living conditions of children. Mr. Fritz Wallner (Germany) celebrated his 60th birthday. Instead of gifts he collected money and sent it to PRO UMANITAS. 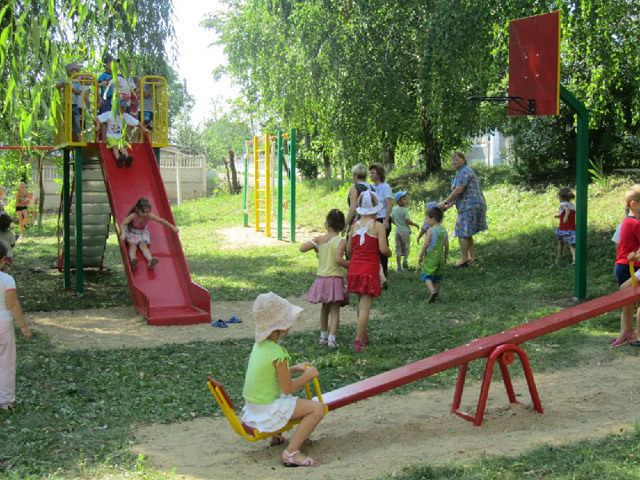 A wonderful playground for the kindergarten in Grigorauca was set up for the received money. This has brought joy and happiness to the children. Children expect their summer holidays each year. It is the best time for our children and youth to pursue many activities not only in their rooms, but also outdoors. The BUNVOLENTIA projects offer the children many activities, so they can learn something new and informative. In addition to this they sing, paint, dance and, of course, they go in for interesting competitions. The educators of the day care centers draw up a program for each day. This enables to make various trips not only to the capital Chisinau, but also to the most beautiful places in Moldova. So, the educators make a great contribution to learning of important things trough fun and useful activities. 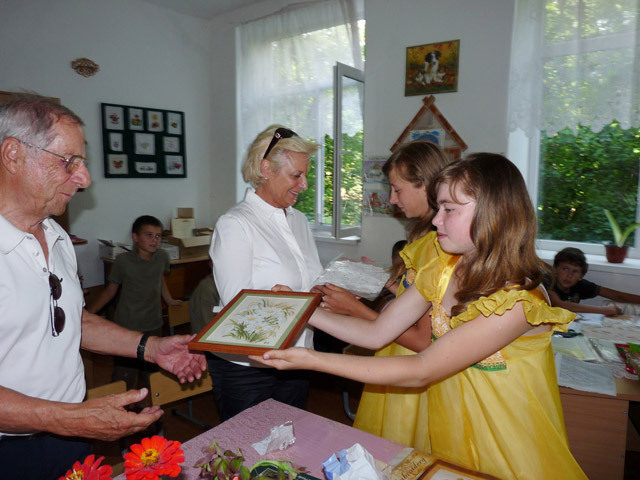 The representatives of the Rotary Club Zug-Kolin, Mr. and Mrs. Gerry and Helen Zühlke, visit Moldova from 13th July 2011, in order to observe the progress of their projects. At the same time a transport with humanitarian aid from Zug – 41 boxes of clothes for children and adults – arrived in the Gangura commune, where we placed 4 day care centers for children. The received goods bring joy to poor children and adults in this commune. The 2nd President of the organization "Hilfe für Osteuropa e.V. 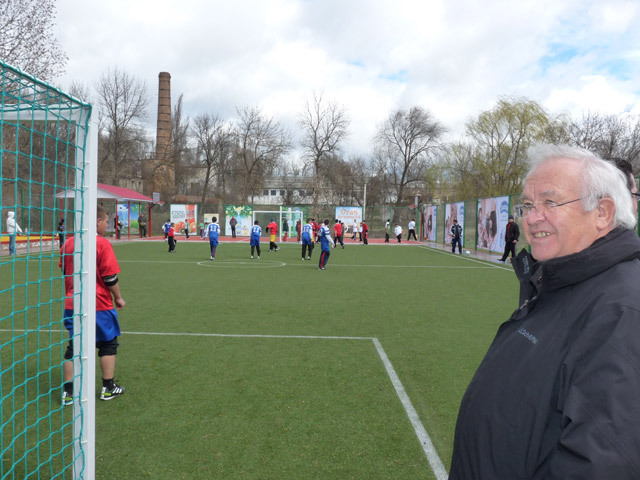 ", Mr. Gunther Köllner was on visit to Moldova together with his wife. During his visit he had a meeting with the godchildren and families; within this meeting he distributed financial funds to the families. A mutually agreeable meeting brought joy to the godchildren and families, who receive great support from donations from Germany. At the invitation of the German Caritas Association the project manager of PRO UMANITAS took part in a conference in Freiburg, Germany. 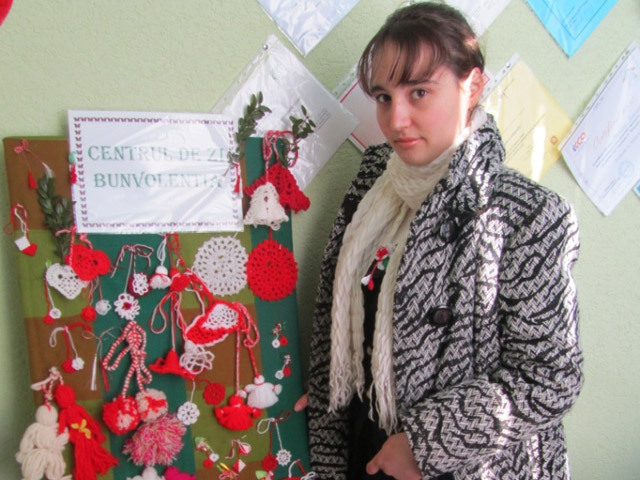 Among 77 participants from 18 European countries she represented Moldova. It was an instructive and informative conference, where a rich information and experience exchange took place. 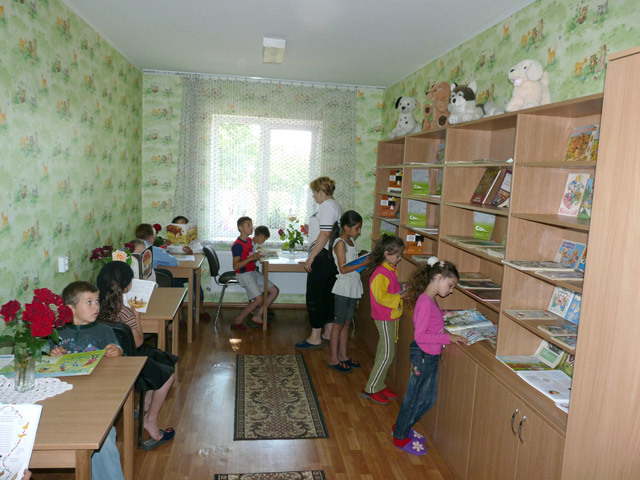 At the request of Haenggeli family from Switzerland, who finances the day care center for children BUNVOLENTIA – Cojusna, a library was opened. This event filled the hearts of children and of educators with joy. Soon they will have a rich literature for their development. 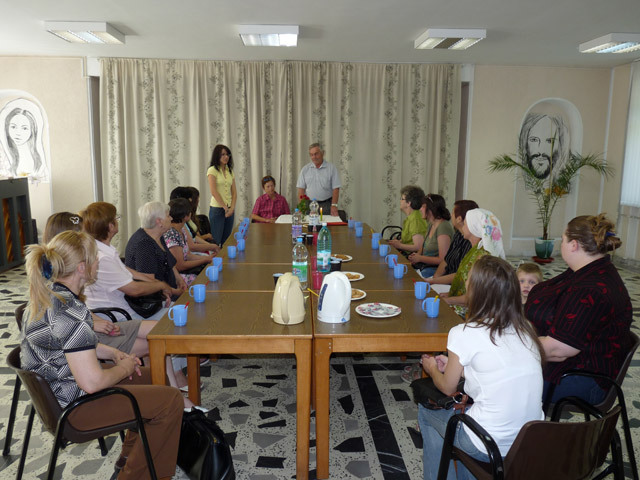 Talks are held to cooperate with the library of the village. At the invitation of Priest Erwin Benz, the President Vladimir Nadkrenicinii and Mgr. 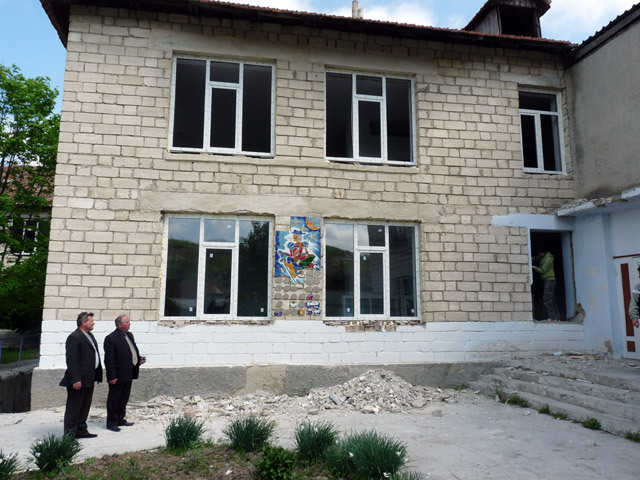 Benone Farcas, General Vicar of the Diocese of Moldova visit different partners – thus, Hilfswerk Liechtenstein, the foundation Don Bosco, the organization "Helfen Sie helfen", the community of Baar, the association Hospital Criuleni and the Rotary-Club Zug-Kolin. During the liturgy in Walterswil they answer questions about Moldova and the projects of PRO UMANITAS. They can experience the sister family in Sonnenberg and are also guests at a birthday celebration, so they get the opportunity to come into contact with Swiss people. June 1st – a long-awaited day, when we celebrate the Children's Day. 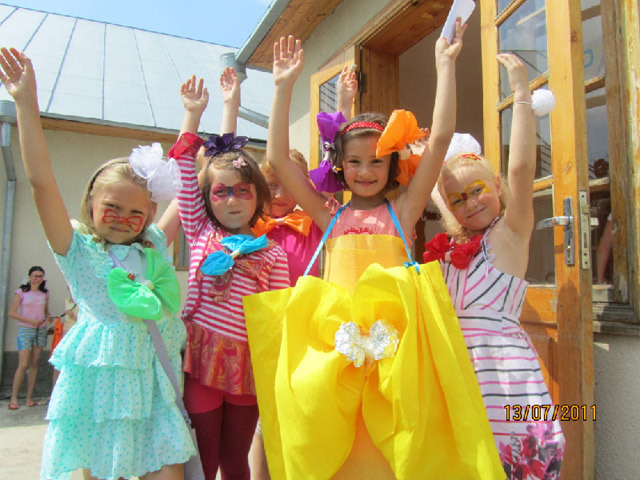 Our little ones from the day care centers BUNVOLENTIA could experience wonderful events. Sports competitions, concerts, various games and of course ice cream and chocolate were part of the daily program. The older children played the role of the animators. 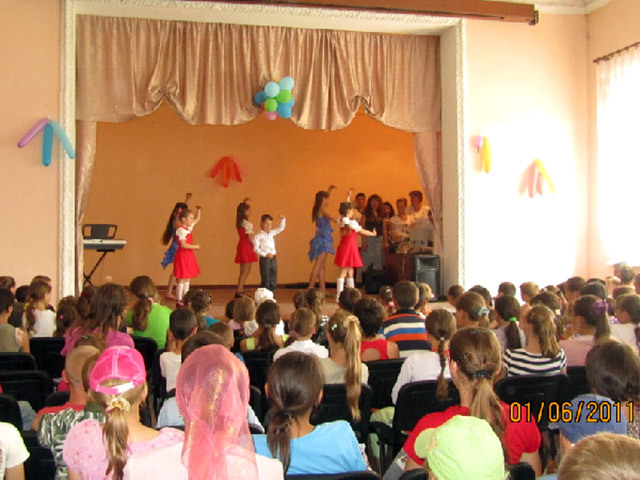 Like real actors, they radiated happiness and joy and spread good mood among all children. 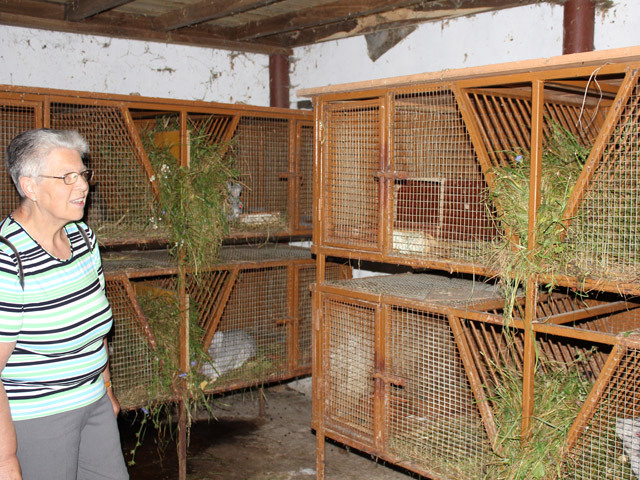 After her last visit to Moldova Mrs. Bernadette Posch from the Austrian organization "My 2 cents" convinced herself of the poverty and need from this small country. She was impressed by the poor conditions under which children live. 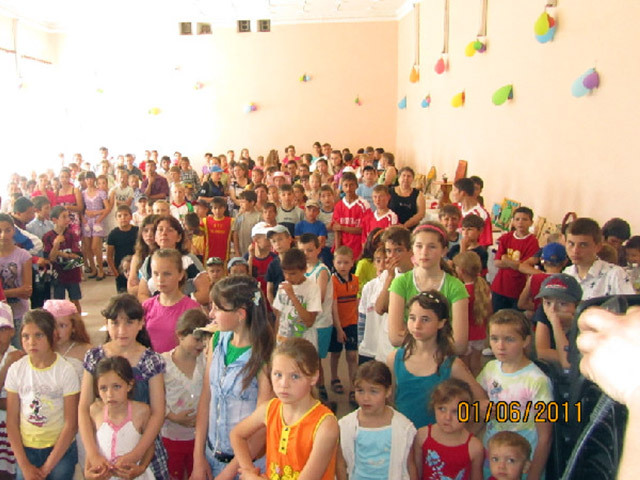 Thus, the idea to hold a presentation, where donations for benefit of Moldovan children were raised, started up. 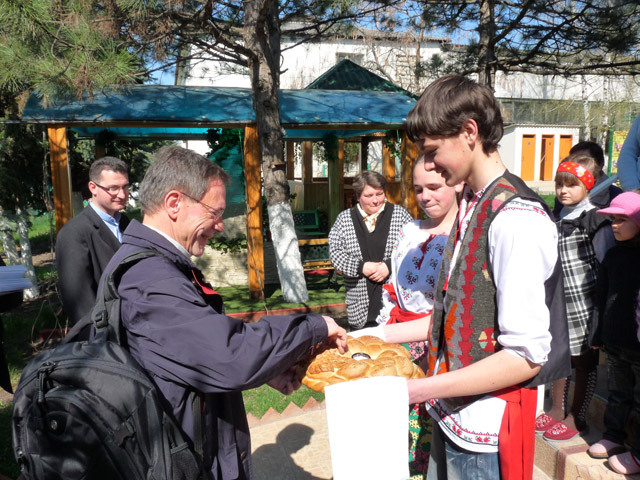 The presentation from April 1, 2011 born fruit, so that money for the kitchen furniture for the school dining room in Cozesti village were collected. New tables, benches and cupboards for dishes were purchased. 87 children, who go to school, enjoy their lunch break now. Words were converted to actions as Dr. Dinko Aracic from "KINDERMISSIONSWERK" visited the kindergarten in Cojusna. 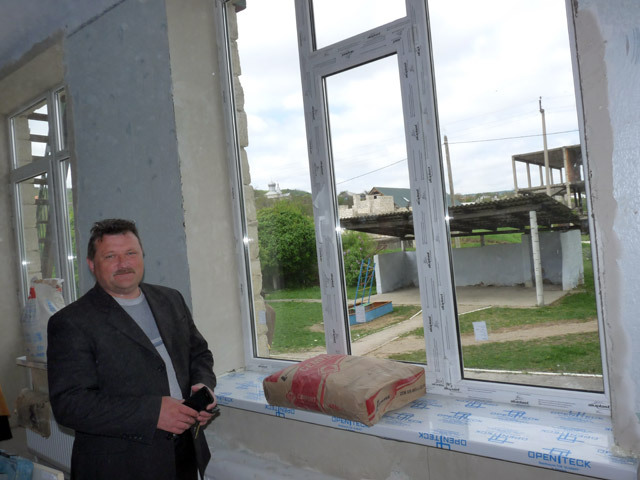 After his visit, the installation works of the new windows and doors in kindergarten started. Newspaper for children "Copiii Mariei"
The children from the day care center "Saint Maria" had the idea to publish a newspaper for children. The first edition with the title "Copiii Mariei" (Children of Maria) appeared by February 2010. This initiative was supported by the children from day care centers BUNVOLENTIA. Now the newspaper with an edition of 500 copies reflects the ideas, thoughts and interests of children of all day care centers. The 5th edition was published on Easter. The German organization "Menschen helfen e.V." finances the costs for the newspaper. 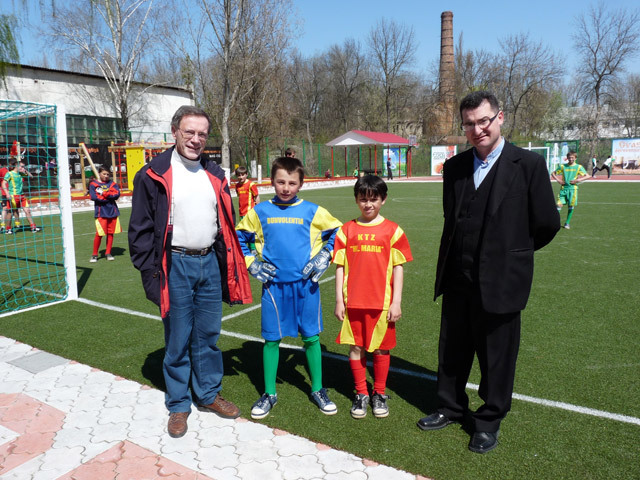 Dr. Dinko Aracic from the German organization "KINDERMISSIONSWERK", who is responsible for the project in Eastern Europe, undertakes his first trip to Moldova at the end of April. He is cordially received by the local Bishop Anton Cosa on his arrival. 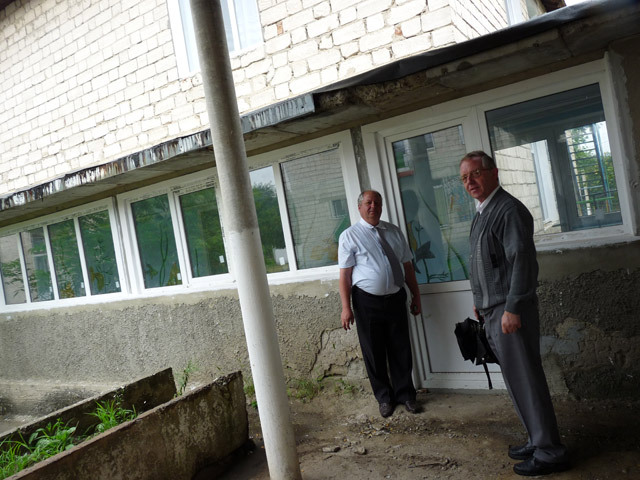 On the same day he familiarizes with his new project in Moldova (the energetic repair of the kindergarten in Cojusna), where he visits the company that produces windows and doors. There is a good cooperation between PRO UMANITAS and KINDERMISSIONSWERK since 2005, when Dr. Aracic has decided to finance the repair works within the boarding school for children with slight mental disabilities from Straseni. 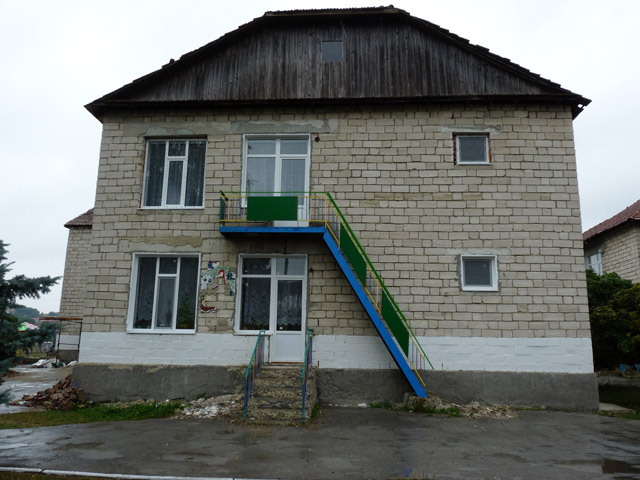 Since then, many other projects were implemented within the boarding school in Straseni and Calarasi Straseni, as well as the repair of the day care center for children "Saint Maria" in Grigorauca and the bakery in Danceni. 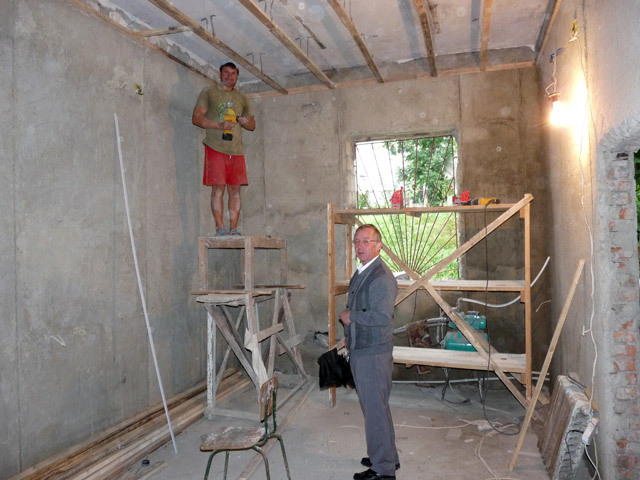 Dr. Aracic has the opportunity to visit his projects in Moldova for the first time. 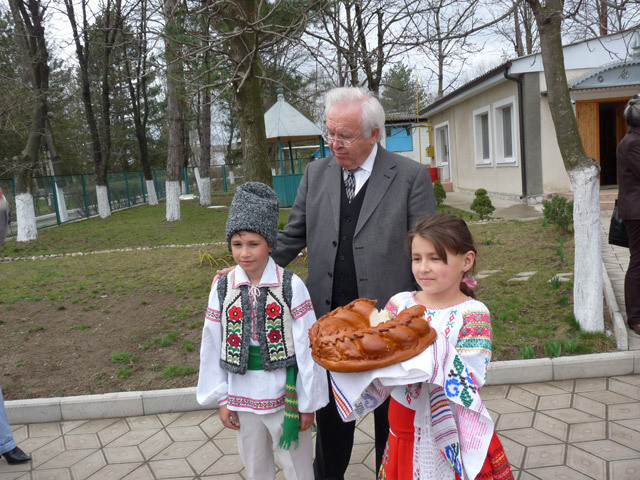 The trip of the President of "Help for Children in Need HCN", Mr. Peter Garst to Moldova took place in the period from 06.04 to 12.04.2011. Together with his wife, Martha Garst he visited the HCN – projects in our country. The main point of this trip was the visit of the day care centers BUNVOLENTIA, and the information and experience exchange seminar in connection with the sports feast in Grigorauca. 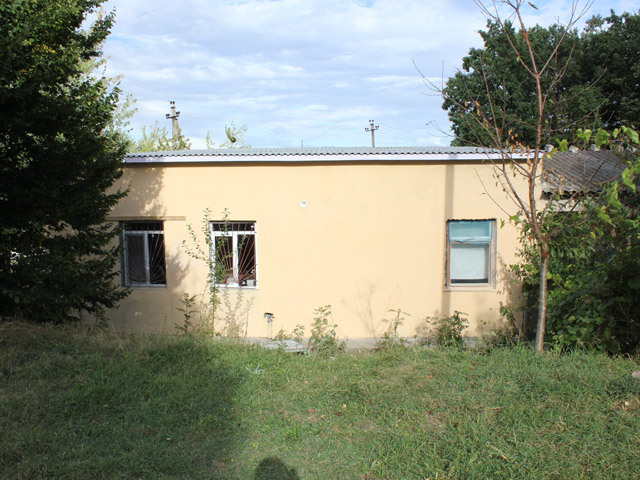 Mr. and Mrs. Garst were very satisfied with the progress of their projects in Moldova. 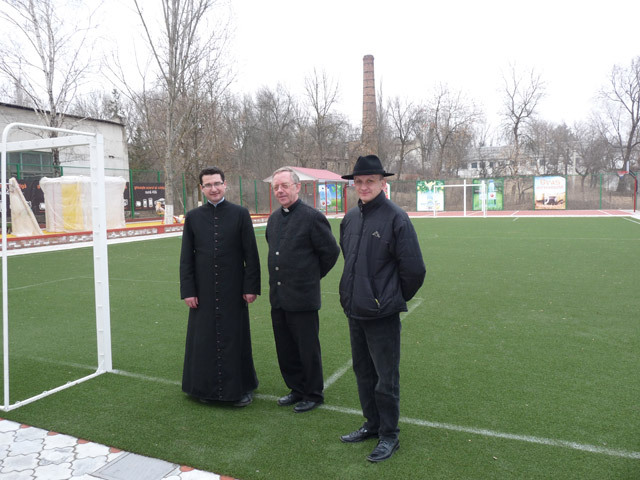 Moldova received dear guests from Germany once again: Priest Hans Bock, Mr. Fritz Wallner and Mr. Walter Schmees came to visit, in order to learn about the projects of PRO UMANITAS. 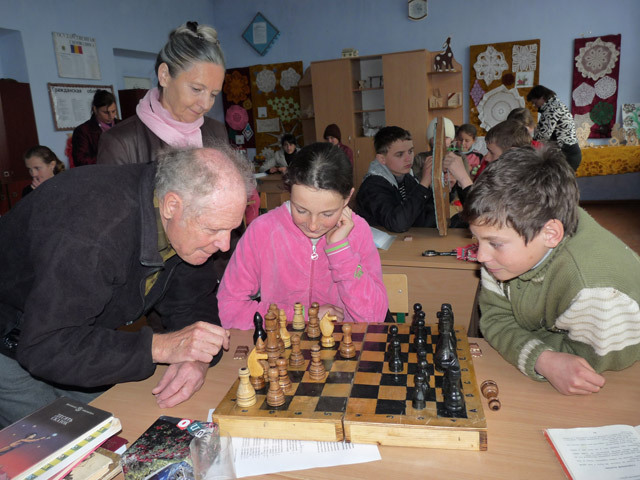 It was the first visit of Mr. Schmees in Moldova. Our guests were impressed and surprised by the implemented projects. They also had the opportunity to participate at the event "BUNVOLENTIA: children's feast". The President of the German organization "Menschen helfen e.V." Dr. Robert Roithmeier and other representatives of the same organization, Mr. Ingo Ingerl, Mr. Johannes Aldenhoff and Mrs. Eva Krapf arrived in Moldova to visit the projects supported by them. 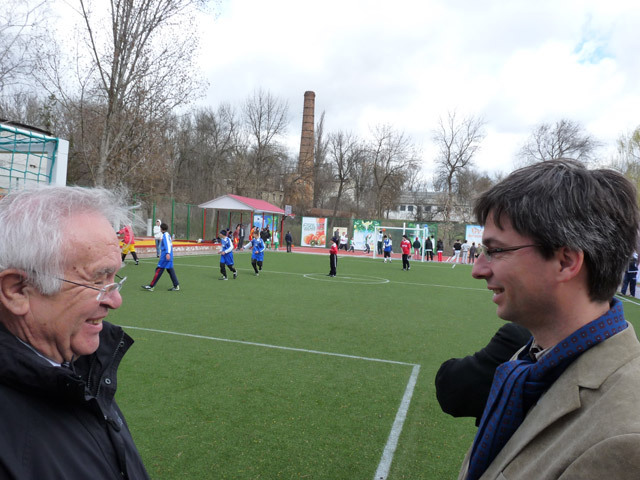 Dr. Roithmeier finances the running costs of the day care center "Saint Maria" and had substantial contribution to the financing of the sports and playground. The sports feast that took place on the newly built sports ground was a nice surprise for them. The performance of their children brought joy to our guests. 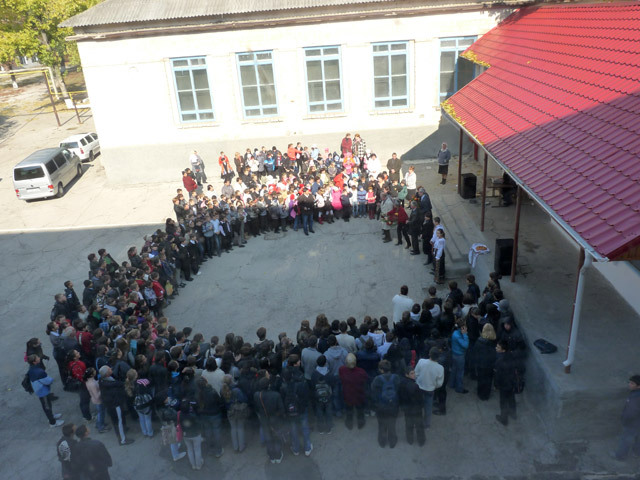 The village Grigorauca experienced an eventful day on April 9, 2011. 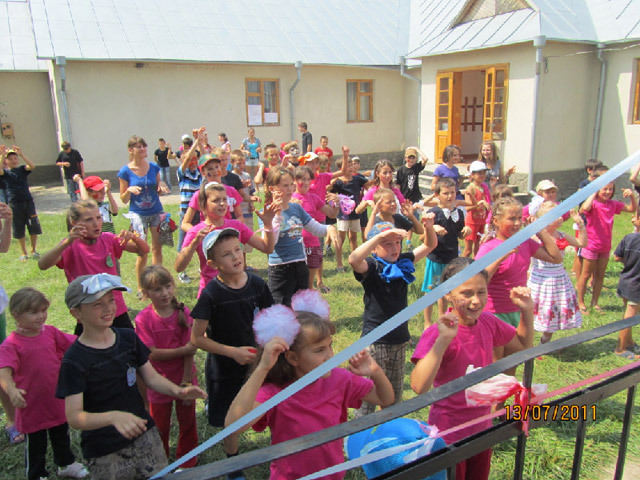 The day care center for children "Saint Maria", the 14 day care centers BUNVOLENTIA and the coordinators, educators and teachers, altogether 231 children and 49 adults, celebrated together "BUNVOLENTIA: children's feast". This important event for children and teachers started with the blessings of Rev. Daniel Medves. 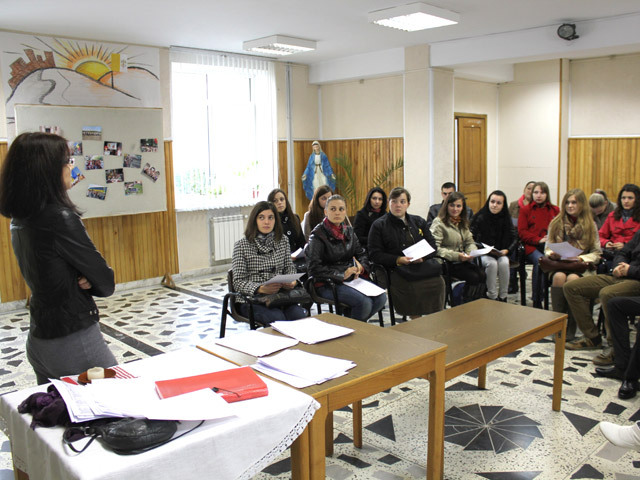 Another information and experience exchange seminar for educators and teachers, an exhibition of children's works and a sports competition among the children of the day care center "Saint Maria" and all day care centers BUNVOLENTIA were held. Guests from Germany and Switzerland, and the Bishop of Moldova Anton Cosa could experience this event. It should be noted that the day care center "Saint Maria" won all four sports disciplines – football, basketball, table tennis and chess. 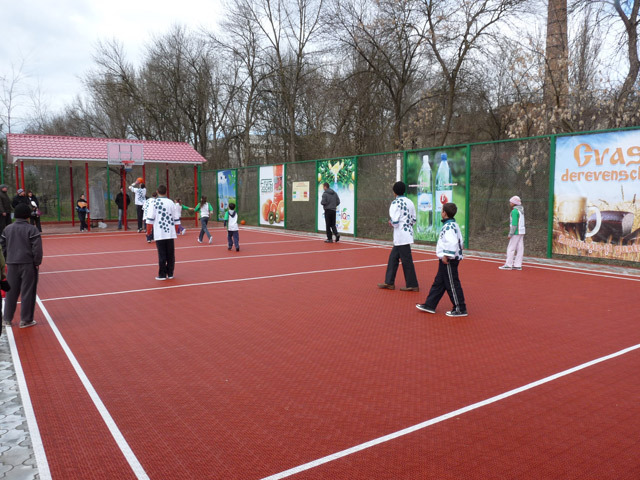 Noteworthy are the performances of the day care center BUNVOLENTIA – Gangura II, which won the silver medal in football and basketball. 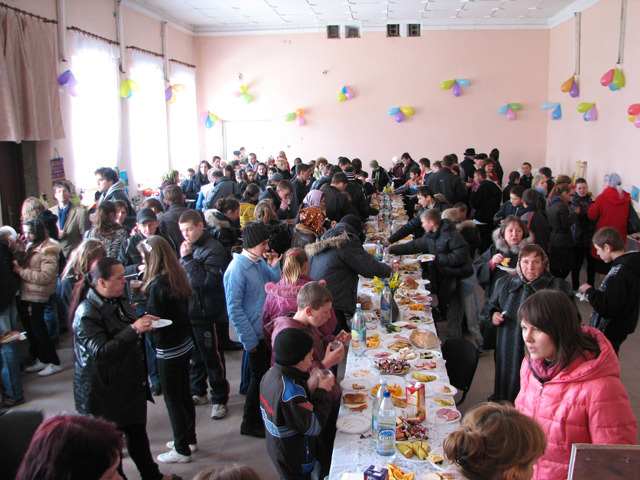 The 9th April 2011 will be an important day for the day care centers for children BUNVOLENTIA, because it brings together children and teachers from all day care centers within the "BUNVOLENTIA: children's feast". "BUNVOLENTIA: children's feast" is an event that includes following measures: information and experience exchange seminar for educators and teachers of the centers, exhibition of children's handworks and sports competition among representatives of all day centers and the day care center "Saint Maria". 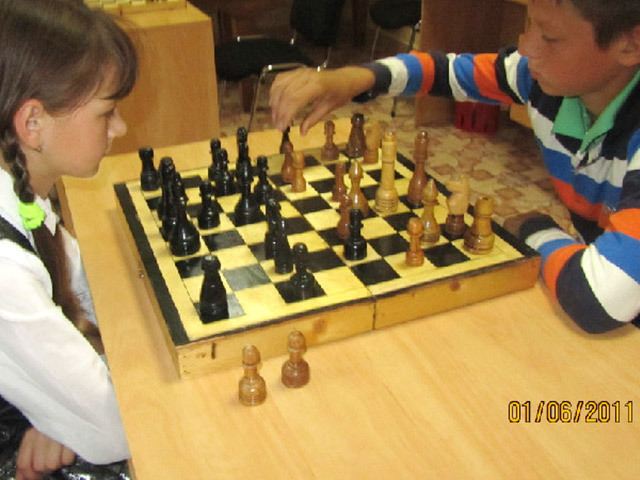 The sports competition consists of following disciplines: football, basketball, chess and table tennis. The children prepare themselves joyfully for their feast. Moldova opens its doors again to an old friend and partner of PRO UMANITAS, Priest Clemens Bombeck, executive director of "Pro Moldavia e. V. ", Germany. 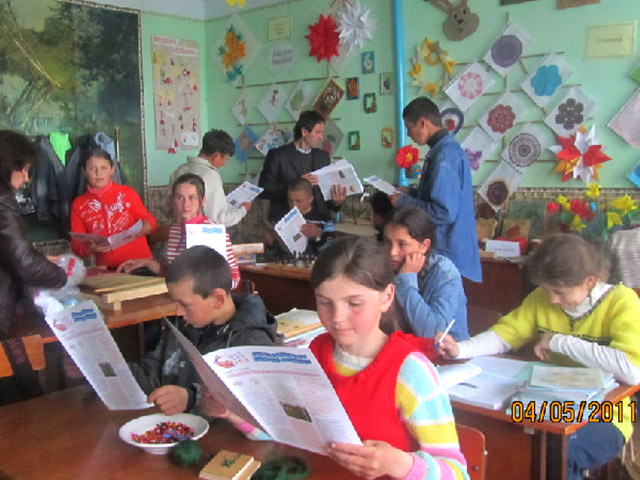 Over 15 years "Pro Moldavia e. V. " supports the deprived people in our country. Besides the projects of PRO UMANITAS, Priest Clemens visited several Catholic Parishes. 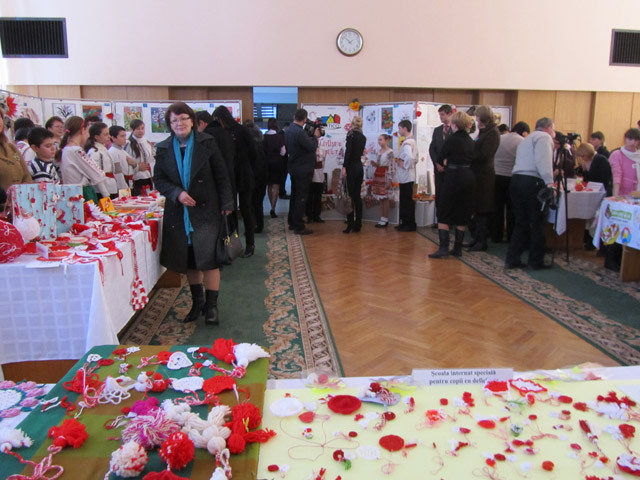 A trade-exhibition, within which handmade works of children from deprived families were sold, took place in government hall on March 2, 2011. The district Ialoveni was represented by our day care center for children BUNVOLENTIA – Gangura among other 2 institutions. Honorable guests – the Prime-minister Vlad Filat, the Vice-Prime Minister Mihai Moldovanu, the Culture Minister Boris Focsa, the Health Minister Andrei Usatii, the Governor of Gagauzia Mihail Formuzal – visited the exhibition and bought several children's works. The money collected by the day care center for children BUNVOLENTIA – Gangura will be donated to a child with disabilities from the village. At request of Dr. 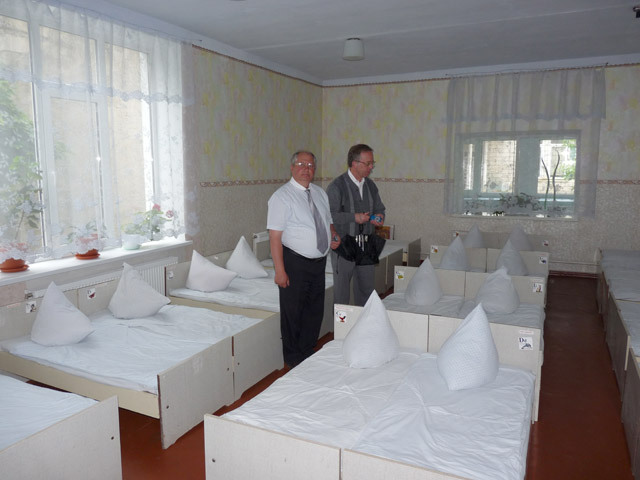 Beat Wicky, the President of the "Association in support of the hospital Criuleni in Moldova" from Switzerland, PRO UMANITAS could purchase bedding for the 80 hospital beds; the beds were delivered with two transports and are already in use. The Government Commission studied the financial and narrative documents concerning the activity of PRO UMANITAS for the last 3 years (2008-2010), and consequently made the decision again that the charitable organization is one of general utility. It handed the appropriate certificate. This state recognition is very important for our activity, as this certificate grants privileges. With the further relief consignment the representative of the Dutch organization "Stichting Hulpverlening Medechristenen", Mr. Cees Huisman arrived in Moldova and distributed relief supplies to the deprived people of Moldova. Also, Mr. Huisman visited the projects of PRO UMANITAS that received relief supplies from this organization. The families supported by the German organization "Hilfe für Osteuropa e.V. 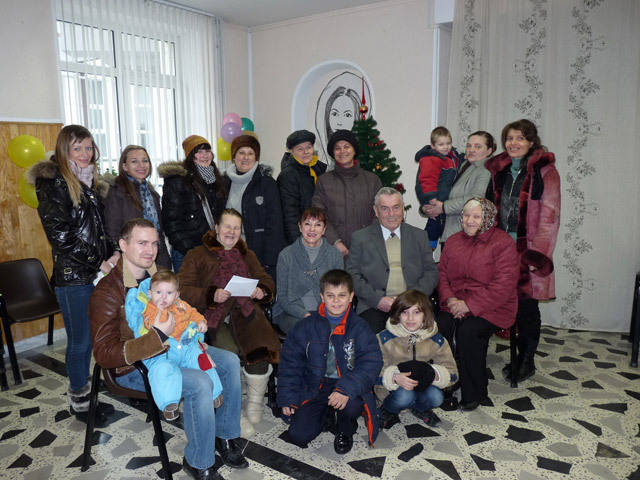 ", President Mrs. Ursula Honeck experienced a happy new beginning of year with the visit of Mrs. Honeck and Mr. Köllner, who congratulated this families on the New Year and Christmas within the meeting from 08.01.2011. 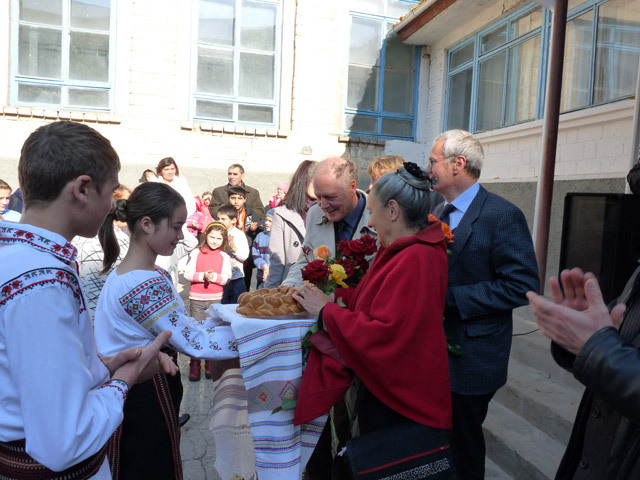 Mrs. Honeck and Mr. Köllner also visited their projects in Chisinau and Orhei.